THE FOUR MEMBERS of the Halawa family, who have been detained in Egypt since earlier this month, could find out as early as today if they will be freed. The Irish siblings have been held in Cairo since being arrested two weeks ago today during Muslim Brotherhood demonstrations protesting the ousting earlier this year of President Mohammed Morsi. The four – Omaima (21), Fatima (23) and Soumaya (27) and their 17-year-old brother Ibrahim – were detained after security forces stormed a mosque. They appeared before a prosecutor on Thursday, with lawyers acting for the family requesting they be freed as soon as possible. 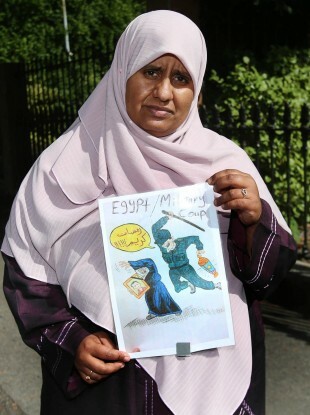 Afterwards, Khadija Halawa, a sister of the four, said they would find out at the weekend whether they would be freed. Authorities in Cairo reunited the four ahead of their hearing – moving the three sisters in with their brother at the camp in which he is being detained. The four are children of Hussein Halawa, the imam of Ireland’s biggest mosque in Clonskeagh, and were on holiday in the Egyptian capital when violence broke out earlier this month. Protests have been continuing in the city this week; yesterday, police fired tear gas at dozens of Islamist protesters attending a rally in support of Morsi. Security forces have rounded up more than 2,000 Islamists, many from Morsi’s Muslim Brotherhood movement, since they dispersed two protest camps in a bloody crackdown on 14 August. More than 1,000 people were killed that day and in ensuing violence, including more than 100 police officers. The crackdown has severely impacted the Brotherhood’s ability to muster protesters. Only several thousand answered their call for mass rallies on Friday last week. Morsi himself is being held at a secret location and faces charges related to his 2011 escape from prison and of inciting the death and torture of protesters. Email “Halawa siblings could find out today if they will be freed”. Feedback on “Halawa siblings could find out today if they will be freed”.